Many EFL clubs now have supporters groups for fans who are LGBT. In a new short film, five of them discuss their football journeys. 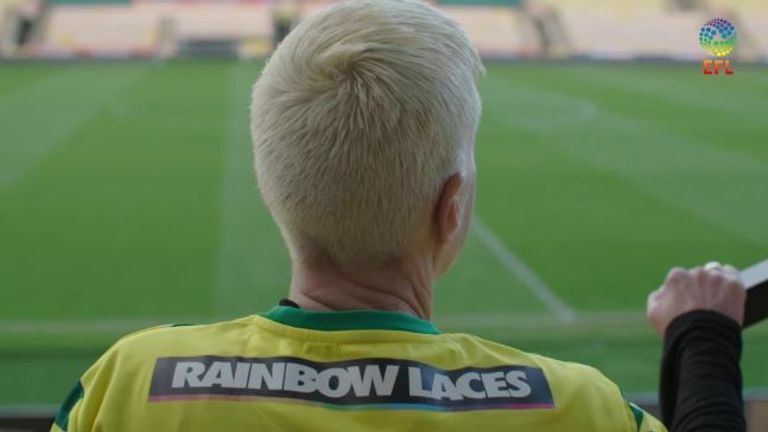 All 72 EFL clubs across England and Wales are currently being invited to back Stonewall's Rainbow Laces campaign in the week leading up to December 1. The EFL has changed its logo to a bespoke rainbow version for the activation period and has now also released a short film to help share the stories of LGBT fans. Also voicing their support for inclusion in football are Dr Michael Seeraj, the head of Equality, Diversity and Inclusion at Charlton, and Nicola Palios, Tranmere's vice chair. The Rainbow Laces campaign is in support of LGBT equality, with a key theme for this year focused on creating more allies for LGBT people in sport. The EFL's support for Rainbow Laces forms part of its wider LGBT work delivered in conjunction with clubs through the Equality Code of Practice. This includes delivering activities, setting policies, and advising on recruitment and education at clubs. EFL chief executive Shaun Harvey said: "The EFL is once again fully supporting Stonewall's Rainbow Laces campaign, with all 72 clubs coming together to raise awareness and visibility of an important issue. "The EFL continues to be committed to providing a match day experience that is safe and welcoming to all supporters across all of our competitions."